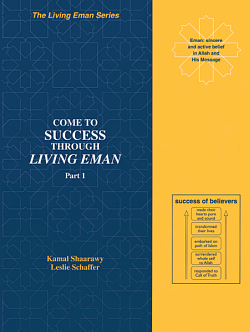 Come to Success through Living Eman… This dynamic textbook focuses the reader’s attention on the necessity to bridge the gap between an intellectual grasp and the practical application of Eman in one’s daily life. By exploring the promises of success that Allah Almighty has made to believers in His Glorious Qur’an and through the Sunnah of the Prophet peace be upon him, we can begin to see clearly the star of transformation leading to that true and ultimate success – in this life and in the Hereafter. The reader is shown the importance of formulating and purifying intention: performing a basic regimen of moral and spiritual practice… practice… practice; seeking knowledge as a lifelong devotion reflecting on meaning, purpose and benefit; practicing patience and perseverance (sabr) as an indispensable step on the path to success; and most importantly, praying to Allah Almighty for His guidance, help and mercy. The requirements of Eman as supplications through worship, vicegerency and morality are looked d closely so that one can see worship as a reality broad as life itself and the virtual joy of living Eman! Vicegerency is shown to have as foundation self-governance, without which the individual is abased, the family is dysfunctional, and communities are corrupt. And Islamic morality is examined and shown to be a perfect code for the art and science of being truly human, a morality which reaches to the very nucleus of our beings and engenders the fulfilling of our Covenant with Allah Almighty.